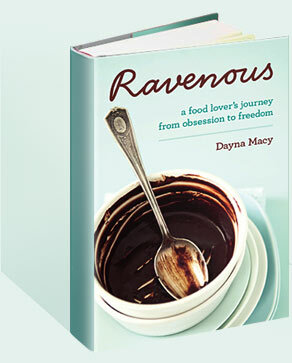 2019 January — Dayna Macy, author of "Ravenous"
I was interviewed last week by the wonderful Emily Francis of healthylife.net. The full interview is here. We discussed Ravenous, which was published 7-1/2 years ago. I’m so proud of that book! I wrote it true. And the journey has continued. Speaking with Emily reminded me how much quieter this weight journey has become, all that noise and chatter about should and shouldn’t, all those disappointments I used to carry about my weight. Truth is, I don’t think about weight that much anymore, and I don’t talk about it either. Through living my life and taking what I’ve learnedfrom Ravenous, I’ve lost and kept off a lot of pounds and several sizes. So though there’s not much more of a weight journey, there is a life journey. My life. And it’s precious, just like yours. Say something kind to your body everyday. No matter what. Your body is the vessel which takes you through the world and it is precious. It is to be honored. And thanked. I found losing weight was easier when I was kind to myself. Weight is not a war, it’s a conversation. The mind is not the General doling out commands. Body, mind and spirit are three equal partners at the table with each spoke of the triad guiding you to what is next. I found it possible only to shed weight when all three aspects of my life were given equal time and respect. To decrease weight, decrease stress. Losing weight takes time and attention. It takes **awareness. And stress can lead you out of awareness into habit. Perfection is the enemy of the good. Your weight is not an ultimate number, it’s how you FEEL embodied, not what you THINK about your body. Develop your internal compass. Do you know what real hunger feels like? (And I say this knowing it’s a privileged question to ask because it assumes there is a choice, which is not always true.) I was always running away from hunger, and the fear of future hunger. But when I allowed myself to feel it, I learned it wasn’t going to kill me. This was a useful tool (and interesting to write about) because i began to discern the difference between real hunger and mouth hunger. And when I was truly hungry I ate. This practice helped me develop my own internal compass around hunger and eating, which ultimately is what you will need to develop in order to keep weight off over a long period of time. Yep, eat your veggies. And drink your water. Eat real food when you can, no matter what else you are eating. The journey is not only about what you leave out but also what you add in. I recommend dancing as well. Keep moving. Whatever brings you joy! Walking, dancing, gardening, the body is meant to move! Take the long view. Weight is not measured in 24 hour increments. Weight arcs over a long period of time. There will be plateaus, your body is getting used to being at a new weight. If and when it’s ready, it will continue. There are healthy weight ranges. Don’t fixate on a number. Take the long view. When given the opportunity, the body wants to heal. Acknowledge that weight loss is a loss. You may have deeply negative feelings about your weight but it’s there for a reason and life is still there even after weight comes off. And finally, did I mention how essential kindness is? I did. And it is worth repeating: Say something kind to your body everyday. No matter what. Your body is what takes you through the world and it is to be honored and thanked. It is precious.